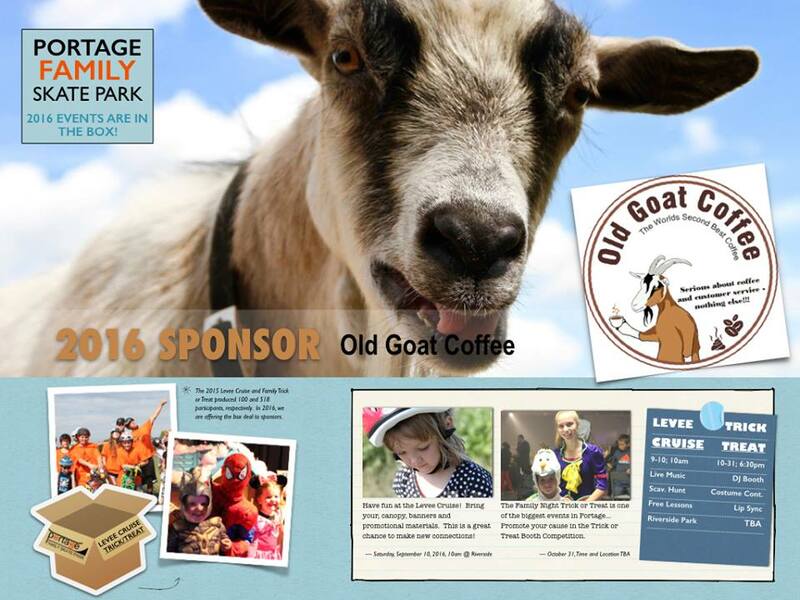 2016 Portage Family Skate Park Levee Cruise! 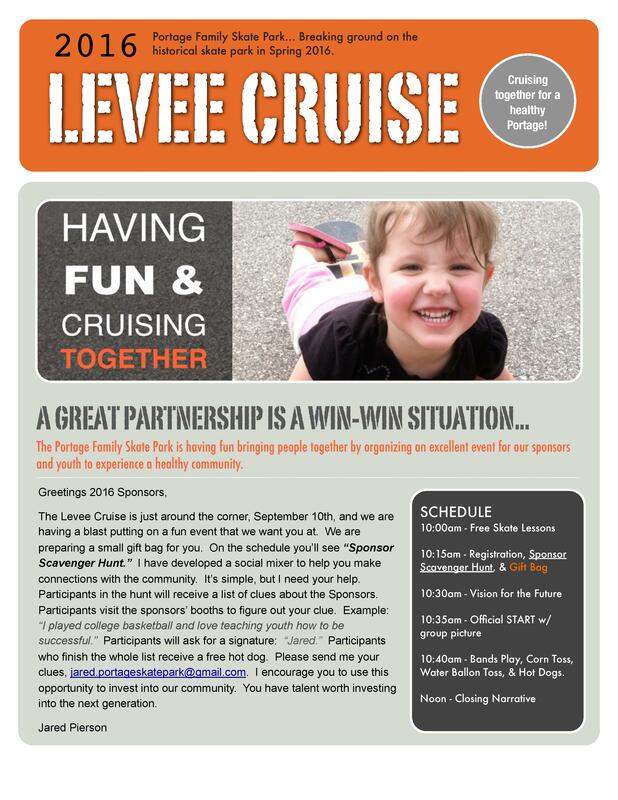 We are having fun bringing people together for the 4th Annual Levee Cruise. 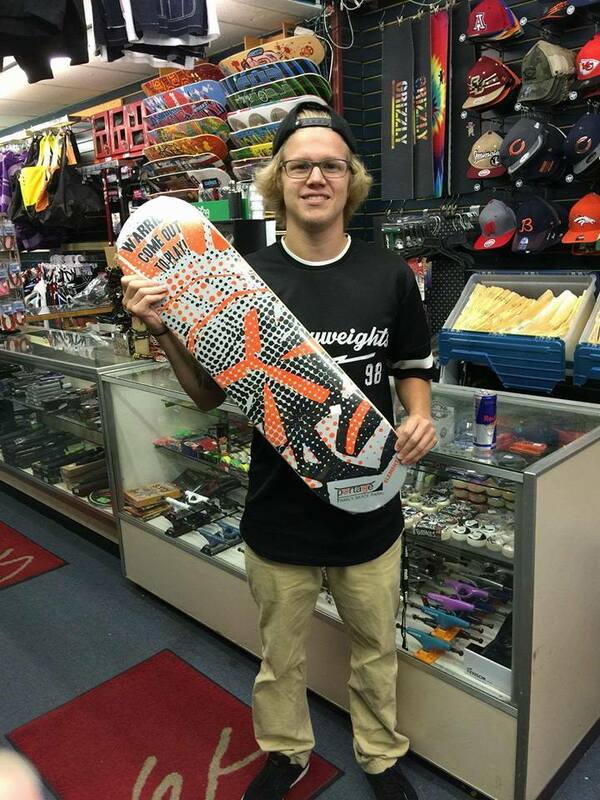 The Levee Cruise is a local skateboarding event with the charm of historic Portage and state-wide recognition! 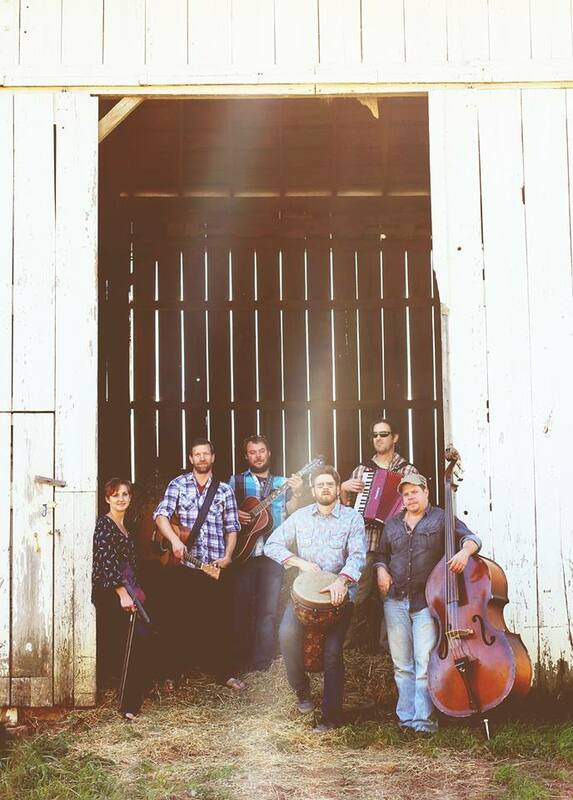 Cruise together on the scenic levee trail, enjoy local musicians, engage with keynote speakers, and picnic at Riverside Park. This event is for skateboard and longboards only. Helmets are required. The cost to register is $20; Free T-shirt with pre-registration. 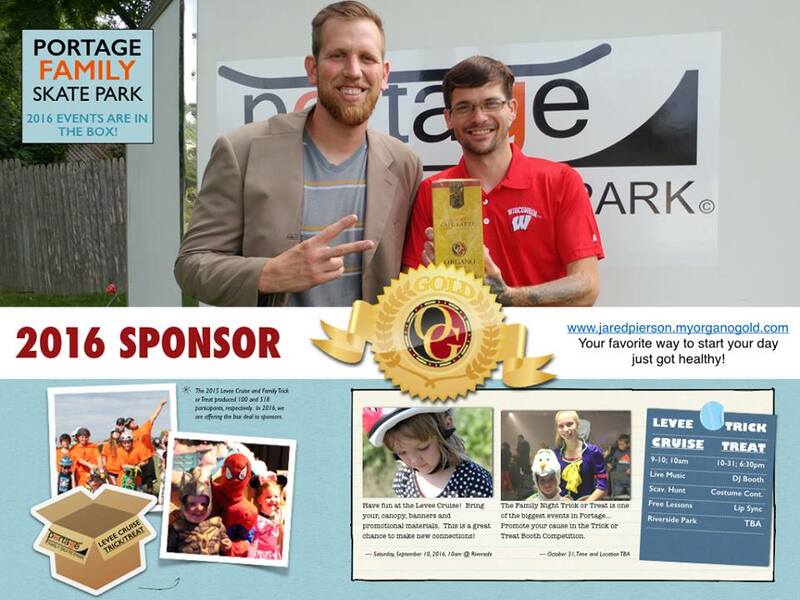 The city of Portage is causing together for a better future and we want you! 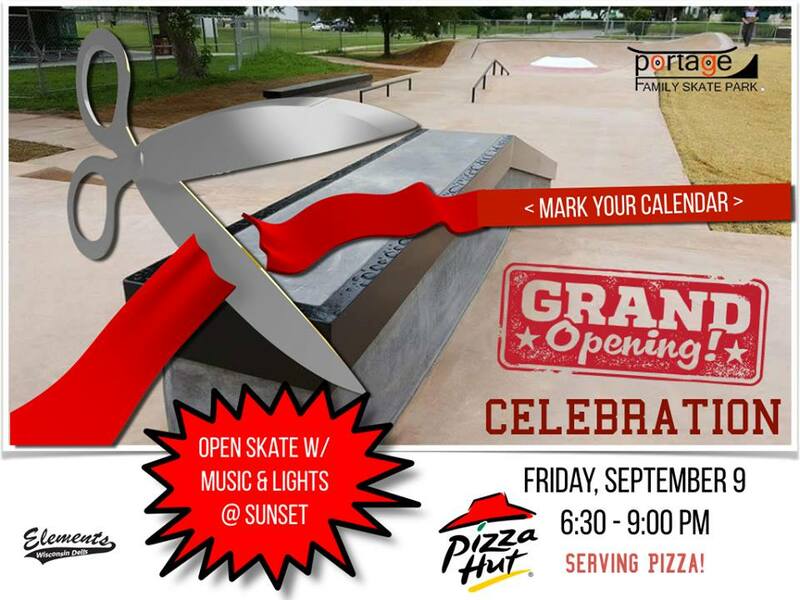 Saturday September 10th, 2016 at 10:00 a.m.
Join the Portage Family Skate Park Committee for it’s 4th Annual Skatepark Levee Cruise to raise funds for the Portage Family Skate Park Project. The push is just under a 6 mile round trip of the scenic levee trail then ends at Riverside Park for a bring your own picnic. This push cruise is for skate boards only. NO bicycles, roller skates, and roller blades will be allowed to participate due to insurance issues. Helmets are required and other safety equipment is encouraged. Cost to register $20, if you pre-register your fee includes a t-shirt. -Balloon Toss Winners will receive small prize. 11:00 am Emcee Jared closes the event with vision; invites people to stay to hang. 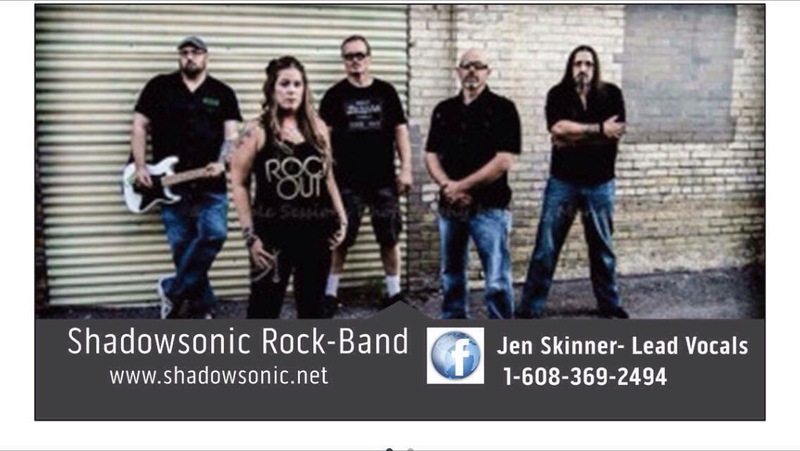 Scott Walters, Kevin Dunham, Jen Skinner and Paul Johnson. 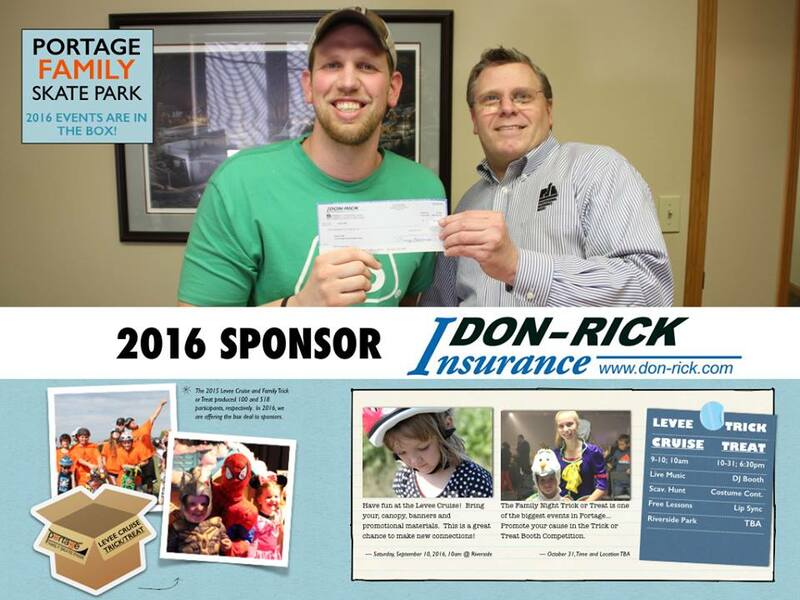 So excited to partner with Don Rick again this year, 2016, for the‪#‎PortageFamilySkateParkProject‬ Love this company and their community mindedness! Awesome staff, and a special shout out to Eric Lewison! You Rock! 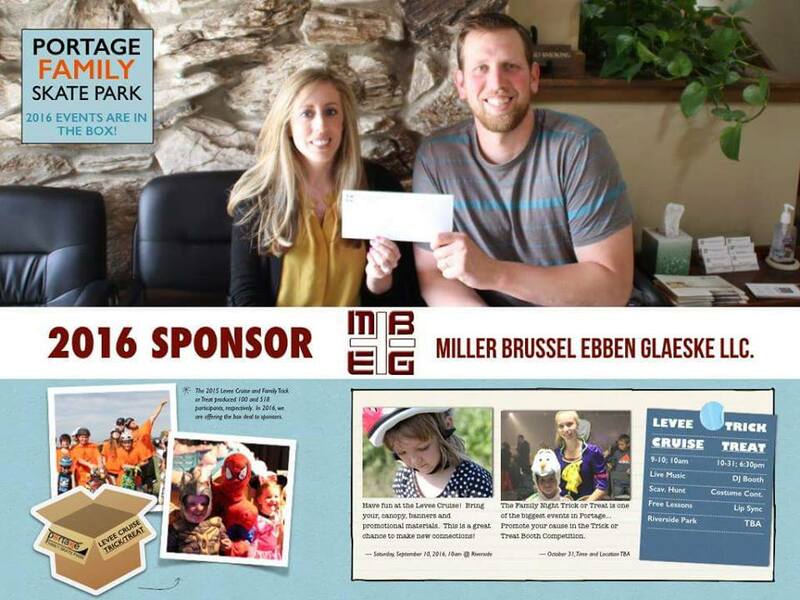 I love this crew… Great people at Miller, Brussel, Ebben, Glaeske LLC! 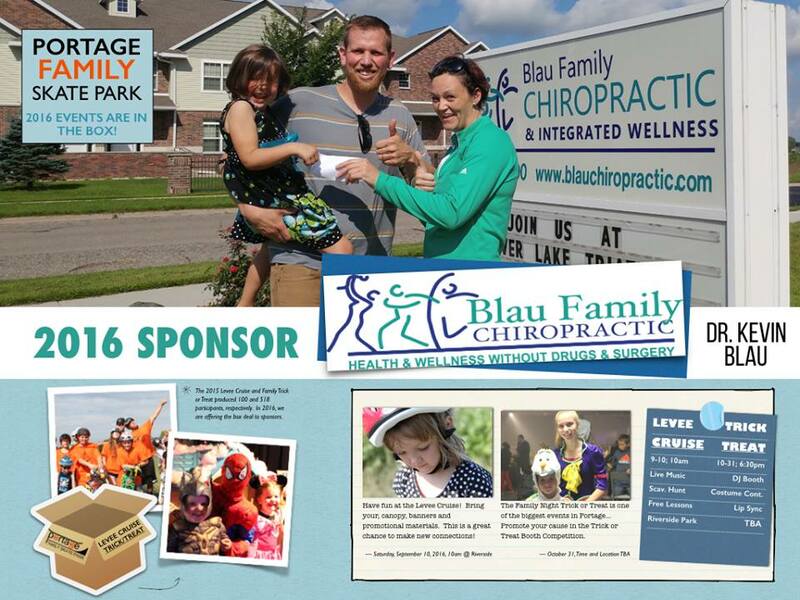 Partnering together for another great year in Portage, WI. 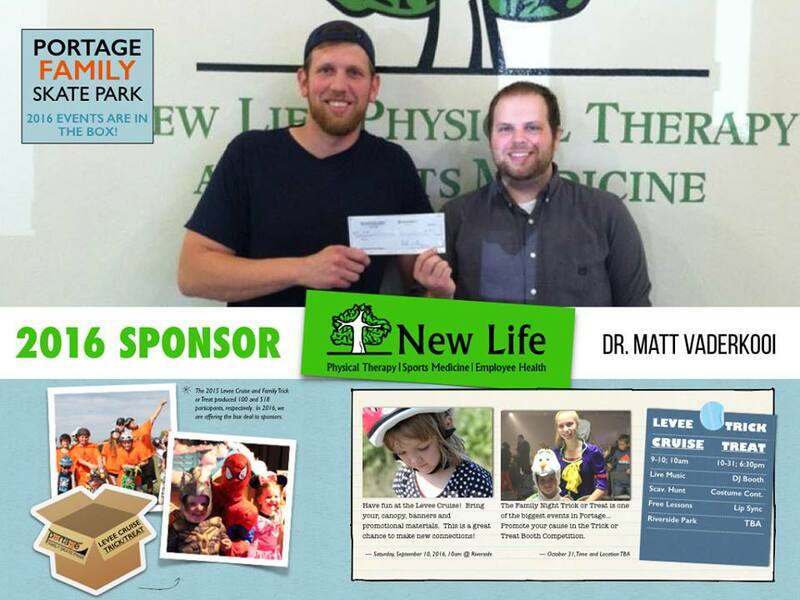 Top of the line therapy, at New Life Physical Therapy… Brandon is great. So thankful for much community involvement! 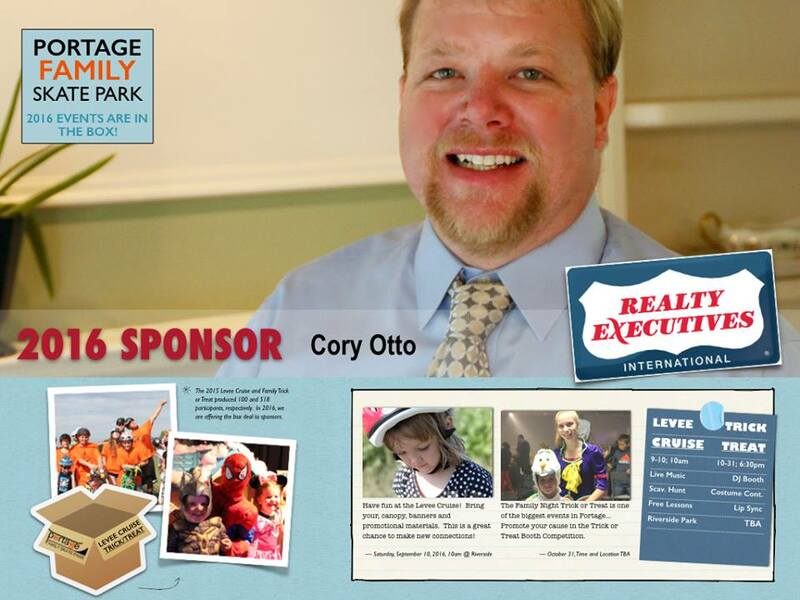 I’m so excited about this team of excellent care givers… so involved in the community. Iron sharpens iron. 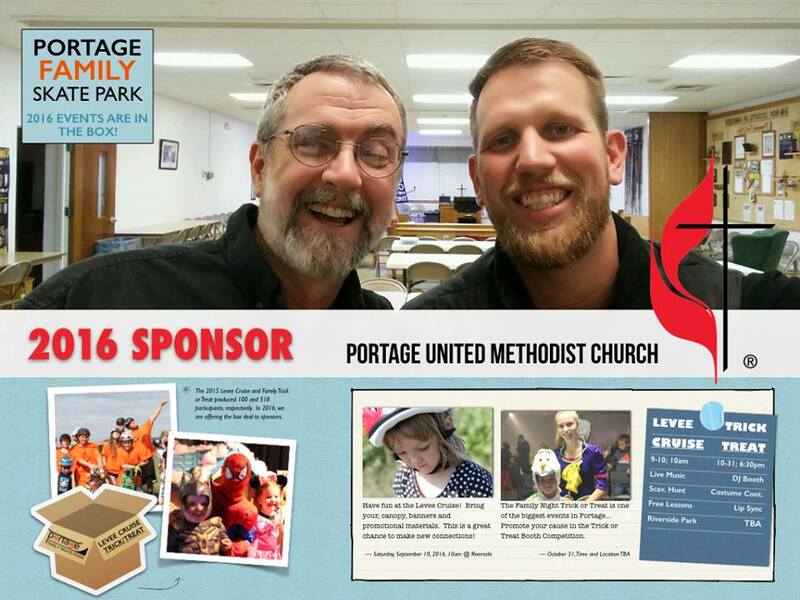 Huge Thanks to Pastor Tom of the Portage United Methodist Church for sponsoring the 2016 events! This church is present in so many ways in our community. Great group of people serving. You must register to participate in this event. Preregistration and day of registration: $20.00Preregistered participants will receive an event T-shirt the day of the event quantities limited (T-shirts must be picked up in person at the event or they will be forfeit), participants that register the day of the event will not receive a t-shirt unless there are some available to purchase. Register the day of our grand opening and only pay $15 for the Levee cruise ride. Deadline to preregister is August 18th. Please put Levee cruise 2016 Registration or Business sponsorship in memo area along with shirt size. C. T-shirt size must be indicated on registration form and in the memo space on your check if pre-registering. Sizes XXL and above are not available. This event will not be rescheduled. Possible reasons the event would be canceled include but are not limited to: Rain, extreme heat, tornado. No refunds given because of the nature of the event as it is charitable. Participants must be dropped off at Riverside Park (Start point). All participants must bring and wear a helmet. The purpose of this event is to raise money for the skate park and awareness for our sport and the construction of the Portage family skate park so it is necessary that all participants show the utmost courtesy to anyone they might encounter during the event. Violation of this will result in expulsion from the event. In the event of a major emergency call 911 and report the incident to an official and/or volunteer. Registration received after August 18th 2016 will be considered day of. Mail Registration forms and payment to: PFSP Levee Cruise c/o Kyle Little 327 River Street Portage WI 53901 Checks should be made out to: Kyle Little-Portage Family Skate Park Please indicate PFSP Levee cruise Registration or Business sponsorship in memo along with shirt size. We will be gathering at Riverside Park after the event, please join us to talk skating and more.